To continue the series on our senses, this week we will discuss the importance of vision. Imagine how different your life would be if you could not see. No more mountain views, no more movie nights. Not even seeing your son hit a baseball or seeing your daughter walk down the isle. The majority of people think that vision is our most important sense. It is also one of the most advanced senses that we have. Over 2000 people get an eye injury each day, just in the United States. This is why it is so important that we get this message out and make our workers more aware of the hazards out there. Construction sites make up the majority of eye injuries with things like sawdust particles, drywall dust, cement, and nails topping the injury list. -Masons and concrete workers, cement can get in the eye and cause a chemical burn. -Manufacturing workers, grinding and chipping can cause objects to go into the eye. What are the biggest eye hazards at your site? Remember, work around you or above you can also create the hazard. Simply walking through the work area in most cases can be enough of an exposure that the workers must be protected. Now, How do we keep our workers protected? In the safety world we have the Hierarchy of Control. The first level is engineering control. This includes using the “built in” or “engineered” items like proper guards or welding shields as a first defense. The second level is administrative control. This includes posting signs or barricades in the work area to keep unauthorized workers away from the area. The last level of control is using PPE. This includes the proper wearing of safety glasses, goggles, and/or face shields. When we talk eye wear, we specifically look at safety eye wear in the work place. When selecting eye wear, ensure it has an ANSI stamp on it. Getting into the actual meaning of the stamp is for another session. Just know that if the safety glasses are stamped, they meet certain requirements as far as shatter resistant, impact resistant, and UV Protection. Just look for the “ANSI Z87.1” stamp as pictured below. 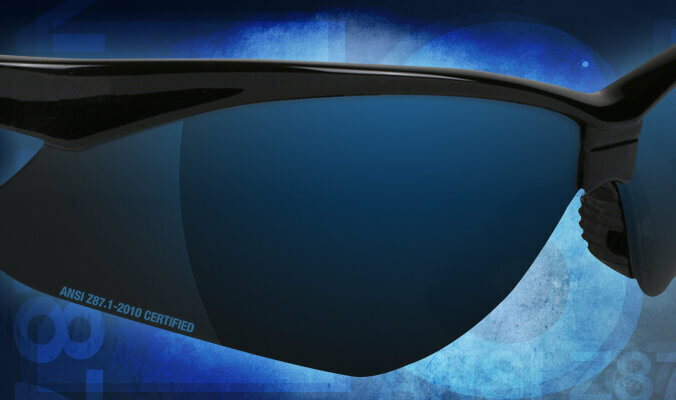 -sunglasses are not the proper eye protection unless it has the Z87 stamp on it. -Goggles might be necessary when dealing with some dusts, liquids, and aerosols. -Face shields are not a substitute for safety glasses. 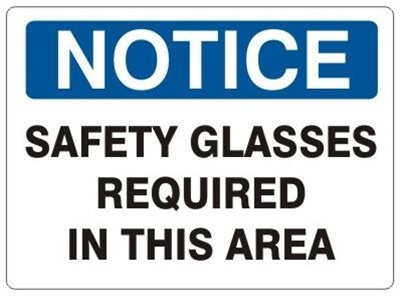 Safety glasses should be worn under all face shields and welding hoods for maximum safety. The biggest excuses are that the worker either didn’t have the proper protection or they did not know that they needed protection. Even “minor” eye injuries can cause life-long vision problems and suffering. Lets get the word out there and keep our workers safe. Next: Next post: Merry Christmas and Happy New Year!